The Manduca Baby and Kids Carrier has been designed in Germany by Wickelkinder GmbH. Orthopaedically designed and packed with features, the Manduca baby carrier is one of the most versatile and comfortable soft-structured carriers on the market. Can be used for newborns (from 3.5kg) and for children up to 20kg (about four years old). The ZipIn zips into the extendable panel of your manduca to give a fresh and fun look, while the organic cotton fumbees attach easily to the shoulder straps which babies, especially teething ones, love to chew on! The fumbees save your carrier straps from the drool and chewing and can easily be put through the wash, saving you from having to wash your whole manduca so often! The manduca front pouch can be attached to the waist band of your carrier using the velcro strap, or use it with the included shoulder strap. It’s roomy enough to hold a nappy change, keys, phone, money/cards and even some snacks. The image below lists the themes for each day of this year’s photo sharing event. Have fun! 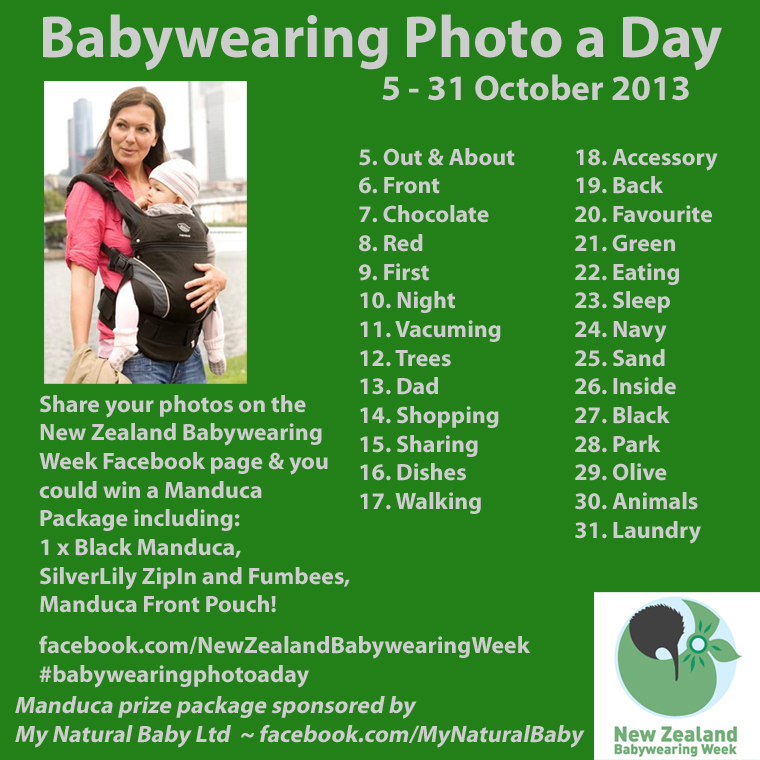 Looking forward to seeing your babywearing pix! This entry was posted in Giveaways and tagged baby carrier, baby sling, babywearing, babywearing accessories, fumbees, international babywearing week, Manduca, My Natural Baby, New Zealand Babywearing Week, NZ Babywearing Week, shoulder strap protectors, soft structured carrier, Zip In, ZipIn. Bookmark the permalink.